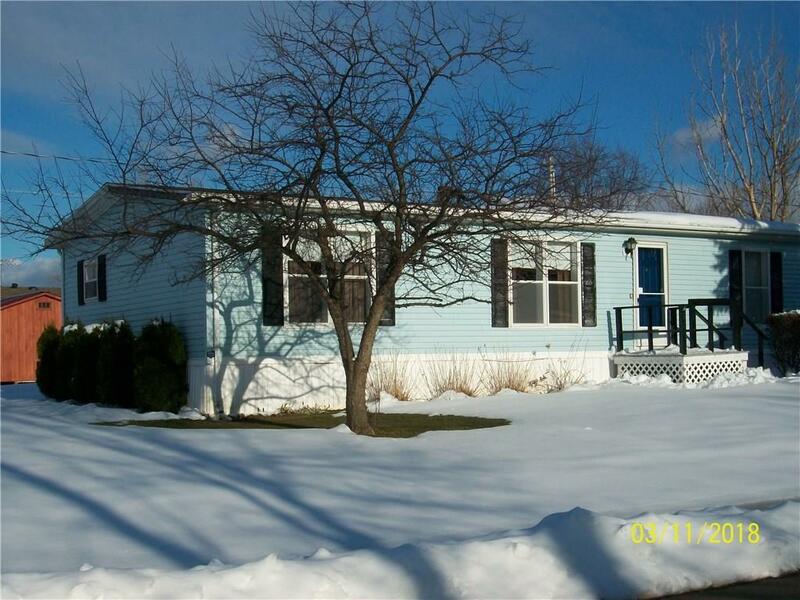 Beautifully Maintained Doublewide Mobile home within a well-kept Park on 1/3 acre Lot! Inside : 3 bedrooms -split plan large master with 10' x 5' walk-in closet. Country Kitchen & Dining combo with built-in China buffet. Dishwasher replaced and special lighting. Ceiling fans with lights in many rooms. Newer carpeting and vinyl floors -including new underlayment. Roof is 30-year with ice-shield. Had tear-off and redone 6 years ago. Fresh paint throughout. Remodeled bath with new steel tub. Newer hot water tank 3 years old. Outside: Paved driveway, covered 11'2" x 7'11"deck, storage shed. Water lines and meter redone 3 years ago during 30 Below 0F cold snap. Beautiful to show...clean, comfortable and nice size rooms. Ceilings 7'4" at sidewalls and over 9' cathedral. MOVE-IN COND. Listing information © 2019 CNYIS, GENRIS, WNYREIS. Listing provided courtesy of Era Team Vp Real Estate-Fredonia.